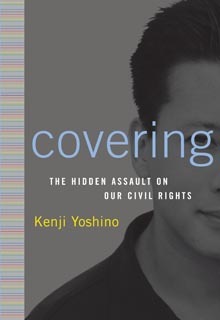 Covering: The Hidden Assault on our Civil Rights was written by Kenji Yoshino, an out Japanese-American professor at Yale Law who originally studied writing. Published in 2006, it shows, because his half-memoir, half-examination of the gay rights movement as it relates to civil rights in general, is extremely well-written and makes the law more interesting than I thought it could be. Aside from sketching out his own life, which itself makes the book worth reading, he follows the progression of civil rights from the pressure on minority groups. For obvious reasons, I’m going to stick with the gay examples of this, but it can be applied to other groups equally well. First we’re compelled to convert (i.e. electroshock therapy and some other violently unpleasant “treatments” for gay men and lesbians), then to pass (such as being gay, just never telling anyone but other gays while using a pseudonym, not having long-term relationships), and finally to where we are now, covering. According to Yoshino, that means not “flaunting it,” which might be marching in a pride parade, acting flamboyant, or holding hands in public. He actually sketches out the need to cover along four axes: appearance (for guys to act butch and women, femme), affiliation (only “acting gay” around members of the “family”), activism (self-explanatory), and association (showing your affection, like holding hands with your boy/girlfriend). And because this blog is about me and my boyfriend, I can’t help but examine how we fit in. Appearance: Neither of us looks gay. I’m not “butch” either, but people who don’t know me or see me alone can rarely tell that I am, and he is definitely in the “masculine” category. I honestly can’t tell if we act the way we do because of internalized societal pressures or because that’s just the way we are. When I was living in France, it was nice to be able to cross my legs the European way in the metro without people looking at me funny. Before I came out, I didn’t like clothes shopping, and even now I try to avoid looking “too gay.” But I don’t have any desire to dress up in a feather boa and march, either. Affiliation: We’ve made a point of acting like a couple even when we’re the only gay people around, which is most of the time. It is tough sometimes, as you might have noticed if you’re a regular reader, and we definitely get flack for not muting our affection in straight company. In fact, I’m going to lump activism and association in here too. We do all of those things (even if most of the activism is through letters and just being ourselves), but I won’t deny that we sometimes face quite a bit of pressure to try to blend in, both via positive reinforcement (usually via women gushing, “No way! I can’t believe you’re gay!”) and negative (like those loving shouts of “Fags!”). While I had thought about most of the points Yoshino brings up, he puts them together well, and his examples of how situations have played out in the courts varied from very depressing to rather encouraging. And it’s surprisingly interesting for a law book; my mother, who generally prefers 19th-century novels and mysteries, also thought it was a great read. Give it a shot, especially if this topic isn’t something you’ve thought about a lot; it could open your eyes. In more bloggerly news, you might have noticed that I’ve taken to adding Digg icons to posts. Please take a second to digg them so I can reach a bit of a wider audience. And don’t hesitate to tell your friends!